Crazy weather! 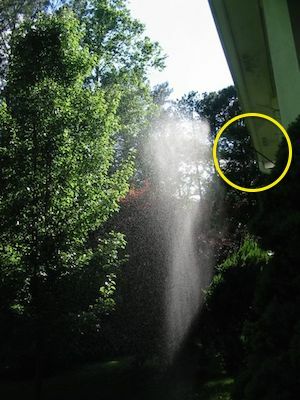 That’s what we have in Georgia, it messes up the natural cycle. It creates havoc on the landscape, causes the horses to colic, and makes bird food go moldy fast… and there’s just a few consequences! A few rainy days in a row coupled with one or two torrential downpours has turned some natural areas of the yard into a muddy mess, which in turn affects the bird feeder poles. They start to lean, like the Tower of Pisa! Enter the the auger with three arms. It’s about the only pole that’s still standing straight. 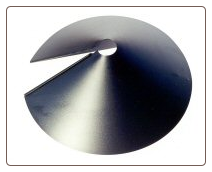 The sturdy design allows for a more secure and permanent installation. Manufactured by Droll Yankees in powder coat metal, you can be assured it’s quality stuff to last a lifetime. A fantastic investment if you’re looking for a sturdy garden pole that will really stay straight! 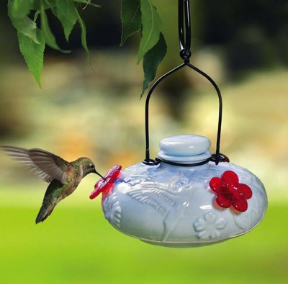 what makes a good bird feeder pole? First and foremost, any yard accessory should look good and be somewhat pleasing to the eye…. for you and feathered friends alike! 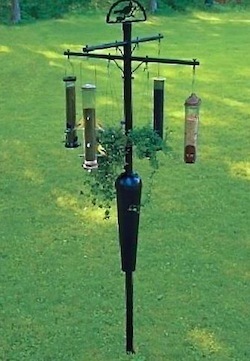 Black or hunter green metal is pretty much a standard when it comes to a bird feeder pole as these colors go well in the landscape. 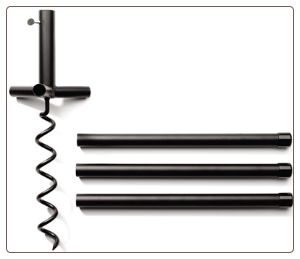 Powder coating is a beneficial feature on better poles as they’ll have a longer life. 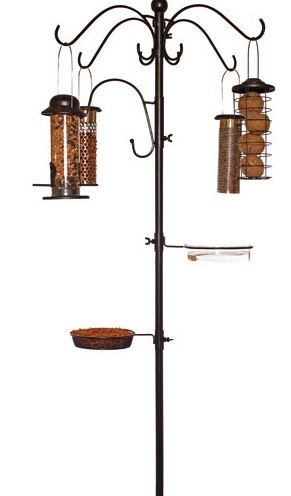 They say variety is the spice of life, so a bird feeder pole kit like this one could really be where it’s at for birds. Why? 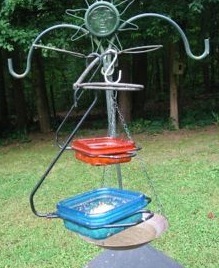 A tray for water, a tray for suet, and three substantial hangers are enough to offer many species a veritable smorgasbord! 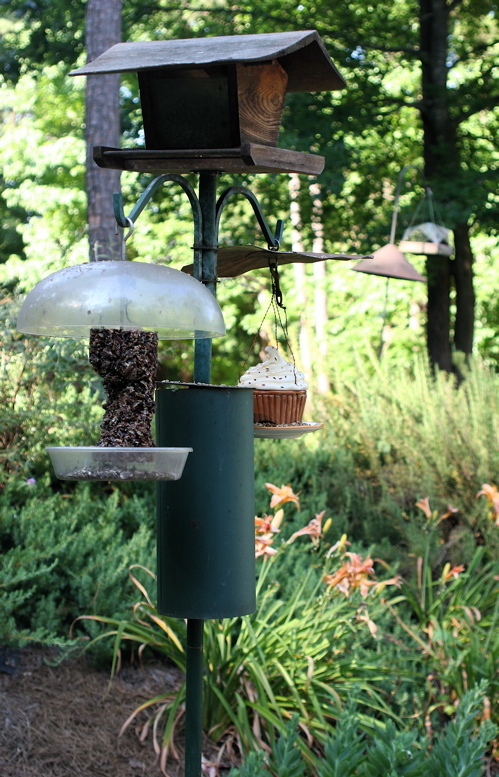 The suet tray could also accommodate a variety of tasty tidbits, including fruit, shelled peanuts, crumbles, or even a mealworm dish. With the big fall migration in gear, there’s a good chance you’ll catch some new and interesting migratory vis itors at a bird feeder pole setup like this. Taller poles are easier to spot and help to keep birds safe from ground predators. 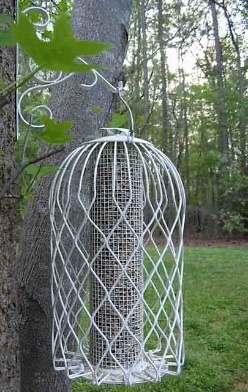 Should squirrels be a problem, a simple wrap-around pole baffle will put an end to their shenanigans for good. Set out the red carpet for fall migratory birds by providing a water source and high energy foods like suet, sunflower hearts, peanuts and fruit. The extra energy these calories provide will certainly help migratory birds on their lengthy journey to winter breeding grounds. 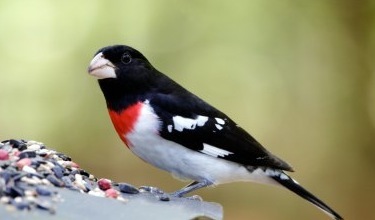 Place a new bird feeder pole in your landscape and see it come alive with the song and color of wild birds! Every single bird feeder (and even some birdhouses) at our place sits with a squirrel baffle attached to it. 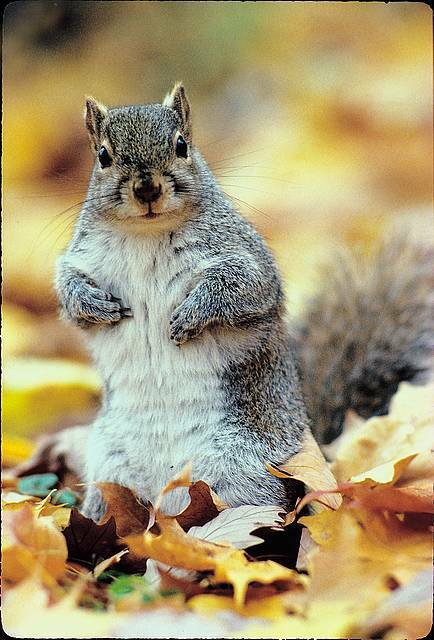 Don’t get me wrong, I like squirrels and feed them pretty darn good, but it’s just never enough. Squirrels are fine in the yard~just not in the bird feeders! Many folks would agree with this too. One 3-arm feeder pole that’s next to the driveway has been the new target of our crafty critters lately, as they’ve learned to jump from the side view mirror of the car when parked near the feeder. This has caused a new plan in parking management, as the second car in is NOT allowed to pull up to the end of the drive. 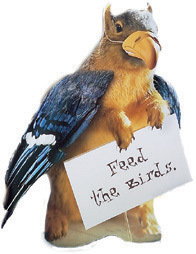 It’s an inconvenience, but saves a lot of birdseed! 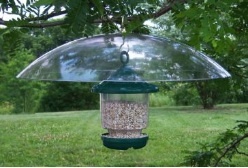 Both hanging and pole mount squirrel baffles are essential to backyard bird feeding if squirrels happen to be present. It’s the only thing that really works. 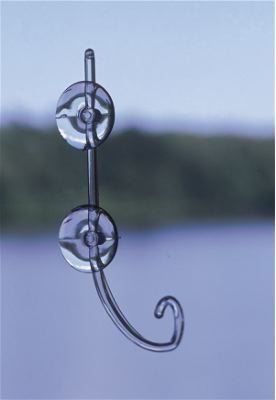 If you have a fancy shepherd’s hook with no straight end to slide the baffle over, these cone shaped ones work like a dream on any size feeder pole. 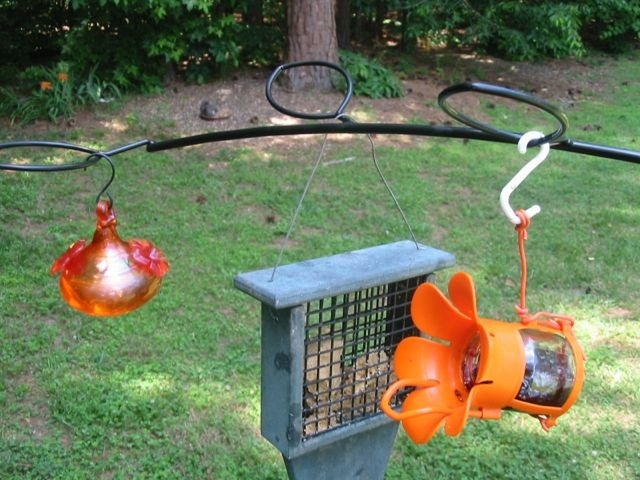 A simple clamp and innovative design will make your feeders squirrel-proof in no time flat! A customer recently told me she purchased those “hot meats” to deter squirrels. From experience I know these will work effectively… for a little while anyway. Pounds of Cayenne pepper has been added to our seed stash-but to no avail because the crafty critters get used to it. The easiest solution to squirrels is hands-down – squirrel baffles! Because I lack any really decent photography equipment, the image isn’t so great, in fact I was pretending to digiscope with a pair of cheap binoculars. But that’s not the point of this blog. 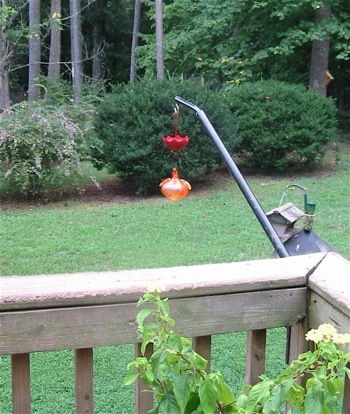 The bird feeder pole where this cardinal is perched sees a whole lot of activity in our back yard. 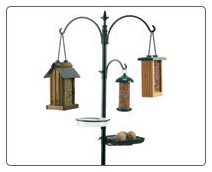 From bluebirds and chickadees to titmice and woodpeckers, the four-arm bird feeder pole offers the perfect perching spot to rest and hunt. 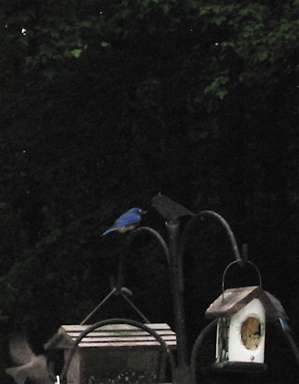 So here’s another pretty bad photo of dad bluebird before he disappeared, perched on the same bird feeder pole . 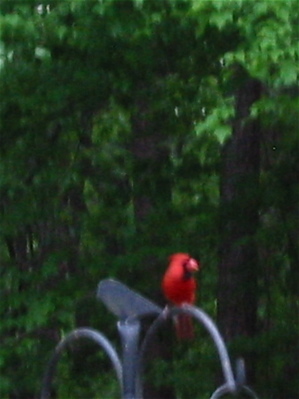 It’s really stinks not having a decent camera because the birds in our yard are many and varied. There’s an Eastern Phoebe feeding two babies, three kinds of woodpeckers, all the usual suspects, and a thrasher who hangs around. Now, if the darn starlings would just hit the road… all would be well.